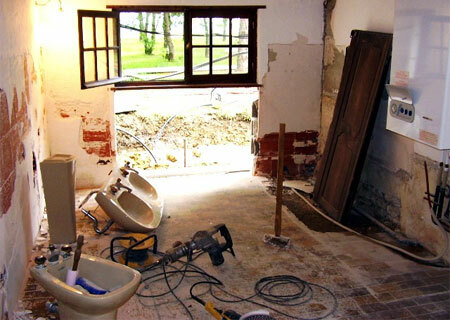 Renovation is a ‘dirty’ word, not only for the dust and mess, but also as a cause of serious stress. Indeed, additions and alterations have been known to reduce grown men to tears and strong women to helpless rage. Jan Davel of RealNet recommends that homeowners planning a renovation or improvement project should budget for it to cost at least 30% more than they originally estimated. Forewarned is forearmed, and there are ways to reduce the anxiety and make sure your project is a success, whether it’s adding on a new room or revamping your kitchen. The first thing to deal with, he says, is the fact that no matter how carefully you or your contractor work, any kind of renovation is disruptive and invasive. "Half the battle is being mentally prepared for the fact that your bathroom or kitchen may be out of action for a couple of weeks, for example, and having a definite contingency plan for this period." The other half is reminding yourself that the mess, noise and interruption of your daily routine is really only temporary, and that you will enjoy your home more when it’s over, he says. "In this respect, it helps to have planned the project really well in advance, and to be as specific as possible about the details." This leads to the second biggest concern homeowners have about renovation – the worry that their contractor will turn out to be incompetent, or worse, a crook. "One unfortunately hears all too frequently about contractors who did not complete projects on time, to specification or within budget, as well as unscrupulous people who have swindled unsuspecting homeowners out of thousands of rands," says Davel. However, he says there is a way to address this too, which is quite simply to work only with established companies and hire only registered contractors who have been personally recommended or whose references and previous work you have personally checked. "Their charges may well be higher, but they will inevitably cost you less in the long run because they will try to do the job right from the start – and if they do make mistakes, they won’t try to make you pay for them or simply abandon the project." Oddly enough, he says, worries about money are usually last on homeowners’ lists of reasons for putting off home renovation projects – and it’s a fact that most people badly underestimate the true cost of such projects. "Once you start additions and alterations, especially on an older home, the work may well expose outdated electrical wiring, faulty plumbing, damp and even termite damage, and whether planned for or not, these problems will all have to be fixed." Consequently, he recommends that homeowners planning a renovation or improvement project should budget for it to cost at least 30% more than they originally estimated. Then, Davel advises they should consult an experienced estate agent in their area to make sure that this planned expenditure will not result in overcapitalisation – “that is, that it would not put their property value over the top in terms of the sale prices currently being achieved in their local market." Finally, he says if they do decide to go ahead with the project, they should make sure that they have a proper contract (checked by their attorney if necessary), which stipulates how much they will pay at each stage of the job. "They should also never, ever be persuaded to part with any of their hard-earned money in advance of the contractor starting work."